Sugarlands Distilling Co. has been sponsoring the podcast for the last few episodes or so, and I have been thinking of creative ways to use moonshine in cocktails. Special thanks to our sponsor, Sugarlands Distilling Co. This entry was posted in recipes, whiskey and tagged collins, collins cocktail, moonshine collins, sugarlands cocktail, sugarlands distilling, sugarlands distilling co, sugarlands moonshine, sugarlands moonshine cocktail on July 19, 2017 by Greg. Straws? Heatstroke. Top 5 summer drinks. We make a Gin Rickey and a Moonshine Collins. Download Season 3, Episode 2 (direct link). This entry was posted in podcast and tagged bartending podcast, cocktail, cocktail podcast, cocktails, cocktails podcast, entertaining podcast, home bartending, liquor, liquor podcast, new mexico podcast, simple cocktails podcast on July 14, 2017 by Greg. We talk about a seminal summer drink: The Margarita! History of the Margarita, including early versions of it. Are frozen drinks frowned upon? Daisy -> Sour -> Margarita. Agave syrup as a sweetener? We make Gary “Gaz” Regan and Robert Hess’s Margarita recipes and do some comparison. A big welcome to Sugarlands Distilling as our sponsor! Download Season 3, Episode 1 (direct link). This entry was posted in podcast and tagged bartending podcast, cocktail, cocktail podcast, cocktails, cocktails podcast, entertaining podcast, home bartending, liquor, liquor podcast, new mexico podcast, simple cocktails podcast on July 9, 2017 by Greg. Evan Williams Green Label. 80 proof, about $10. The “bargain priced” Evan is really a value bourbon like no other. Distilled by Heaven Hill, who is one of the only remaining family-owner bourbon distillers in the country, Green Label may not be considered as sophisticated as some of the higher end bourbons out there, it has a balanced yet spicy flavor profile. Because of the proof of Green Label, even though I usually like by bourbon with a lot of ice, I drink this one neat or in cocktails only. Evan Williams Black Label. 86 proof, about $11. Black Label is our Simple Cocktails “well” bourbon. I always have a bottle on hand as I find it’s got the cinnamon-spice-zing that I love in whiskey. For $11 a bottle, it’s value is excellent, and it’s higher proof than Green Label, so I can ice it up when I sip it straight. Evan Williams White Label Bottled-In-Bond. 100 proof, about $13. With the price and favor profile of White Label considered, I feel comfortable saying this is my favorite bourbon. I’ve not tried another in this price range that had the flavor profile I seek after (higher rye, higher spice) like this one. There’s a touch more burn with White Label as it’s higher proof than anything else Evan Williams produces. Like it’s little brothers, this bourbon serves a spice-forward balanced profile of cinnamon, caramel, clove and nutmeg. Evan Williams 1783. 86 proof, about $15. As you can see, you can explore almost the entire line of Evan Williams bottles for less than $15 apiece. 1783 is a more specialized and, dare I say, delicate bourbon than the value line, though. While I’m not sure of the mashbill (the grains making up the bourbon), I suspect a little less rye and a little more wheat or barley in this one. It’s subtler and I found this is a better fit for drinking neat. I found the flavor set too delicate to pair with most cigars, too, which often pair better with a bolder whiskey. Evan Williams Single Barrel Vintage. 86 proof, about $25. This is the best-of-the-best in Evan’s world. It’s a bottle at a price that you can easily keep 2 or 3 around to serve to guests and it’s quality is definitely good enough to sip alone, but the price won’t prevent you from considering it in a cocktail either (Old Fashioned, anyone?). It’s flavor profile is more in line with the colored-label brethren above, so a bit more spice and sizzle than the cool sweetness of 1783. This entry was posted in reviews, whiskey and tagged different types of evan williams, evan williams bourbon types, evan williams bourbons, evan williams family, evan williams walk the line, types of evan williams, walk the line on June 21, 2017 by Greg. Local literature: $20-50. I have been a New Mexico native most of my life and my state pride has grown gradually. This year, I got my hands on 2 newer books published here that and distinctly New Mexican. Look into My Eyes: Nuevomexicanos por Vida, ’81-’83 (buy at Amazon) is a photo book from a very specific snapshot of time in New Mexico’s history: 1981 to 1983 and it’s an amazing mashup of hispanic and 1980s culture. ¡Órale! Lowrider: Custom Made in New Mexico (buy at Amazon) is another one of those precious snapshots of our local culture in beautiful color with great historical context of the significance of “dropping” your Chevy Impala. Fidget spinners: $20-70. Clearly this is a fad on one saw coming, but you can now find plastic 3-pointed spinners in just about every gas station or roadside stand in this country. I wanted to illustrate what a more “fatherly” spinner looks like, so I got some spinners from UltraSpinners and Syner-EDC. UltraSpinners have a variety of spinners ranging from $20 to $150, but I stuck with their Ergo line, which has 3 options in materials and weight. The Ergo Aluminum is $20 and a lightweight but “grown-up” alternative to plastic spinners. Ergo Omega and Alpha are both brass, for $55 and $60 respectively, and only differ in weight and thickness. I also picked up a Triple Mini Spinner from Syner-EDC (pictured bottom) for $40, which offers customizable bearing caps is various materials. Apple Watch Band: $85. Monowear makes a new and apparently very-popular Apple Watch band out of perforated leather that’s classy. They match the hardware to the watch color (a must in my book) and the band’s available in chestnut, black and grey (I got grey). As a daily Apple Watch wearer, I always love having more options to accessorize and match my tech with my clothes for the day. Playing Cards: $5 a deck. I picked up Cocktail Party, Craft Beer, and Craft Brewers decks from Bicycle – it’s a fun way to jazz up your poker games with some “fatherly” knowledge of cocktail recipes and craft beer. Plus they cost next-to-nothing! Scotch Whisky: $85. Scotch is particularly suited for gifts because if often comes in a gift-worthy sleeve. For this Father’s Day, I picked up The Balvenie 14-year-old Caribbean Cask, a spicy, vanilla-forward sipper that pairs beautifully with the next gift idea….. Cigars: $5 and up. From Holt’s Cigar Company, our sponsor for this Gift Guide, we’ve got a great selection of smokes in our humidor (stay tuned for upcoming pairings at Simple Guy Stuff). For Father’s Day, Holt’s recommends the Royal Flush Super Sampler, one of many great options in their Father’s Day Cigar Deals category. Special thanks to Holt’s for their sponsorship of Simple Cocktails and Simple Guy Stuff! This entry was posted in gifts and tagged balvenie caribbean cask, bicycle cocktail cards, bicycle craft beer cards, bicycle craft brewers cards, father's day gifts for guys, fathers day, fathers day book, fathers day gift ideas, fidget spinners, gifts for guys, holts cigar, holts cigar gifts, monowear band, monowear perforated band, new mexico books on June 10, 2017 by Greg. 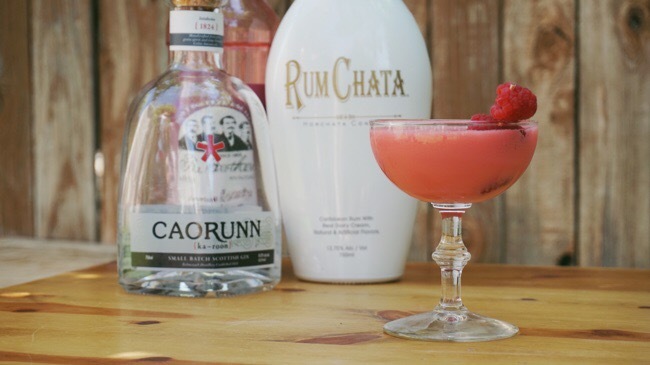 We’re no strangers to RumChata here at Simple Cocktails. It’s been my liqueur of choice for Christmas gifts, and here in the Southwest U.S., it’s a very hot seller on a regular basis. Here at Simple Cocktails, I was introduced to the product almost 5 years ago, when I made a Chata Café Cream. While the RumChata really starts flowing in my house once Fall arrives, I’ve started to think about ways to use this horchata-rum-cream liqueur all year around, and the first time I’ve tried was a huge hit at our home cocktail parties: a fruit-salad-in-a-glass of sorts, a Tiki-friendly drink with a light green hue: the Coolchata. This entry was posted in liqueur, recipes on May 12, 2017 by Greg. Recently, Hydro Flask has added some cool beer-and-spirits accessories to their already-popular line of water bottles. One such product is the 10-oz Hydro Flask “Rocks” cup. Built similarly to their water bottles and growlers, the Rocks is a 10-oz insulated stainless container with a drink-through lid for whiskey-sipping on the move. I would imagine those who enjoy camping and hiking would throw this cup in their backpacks for sipping during downtime, and low-volume coffee drinkers (espresso, in particular) will likely consider this a godsend. While I appreciate all sorts of drinkware with the quality Hydro Flask design and quality, I’m left feeling like the design of the Rocks is lacking, though. It keeps drinks cold for up to 24 hours, so why not provide it with a leak-proof lid design so you can have your whiskey in the cup as you hit the trails? It’s current design requires an additional flask or bottle to transport your booze to its destination before pouring into the cup. Also, even for Hydro Flask lovers, the cost of these cups is a bit prohibitive from building a whole serving set of them at $25 each. As a non-outdoorsy-person, I’ve found my best use for the Hydro Flask Rocks cup is on the nightstand for bourbon on the rocks. The non-sweat design prevents glassware rings and avoids the need for a coaster. This entry was posted in gifts, reviews and tagged hydroflask old fashioned cup, hydroflask rocks, hydroflask rocks cup, old fashioned travel cup on April 5, 2017 by Greg. There are few historical figures that I celebrate on an annual basis, but Charles Tanqueray (born March 27, 1810) is one of them. Gin was the first spirit I fell in love with, and Tanqueray has always been my gold standard for London Drys. The following is an excerpt of an interview I did with Tom Nicol, Tanqueray’s previous master distiller. “Tanqueray was a genius” says Nicol, explaining that Charles was passionate about making things and he invented many items – other than gin – over the course of his life. Some examples include a formula for horse saddle polish and medicines for injured animals. It’s often reported that Charles rejected his father’s life in the church to distill gin, but there’s no evidence that Charles was on track to the clergy at any point. He was smart, to be sure, but Charles didn’t show any interest in attending university, and that was required for the pulpit. He sought to invent, to create, and to experiment. Though he was a proud man, Tanqueray’s personal life is strangely undocumented. This leaves us to wonder: was Tanqueray obsessed with his business, but absent from his family? Or was he just a very private man who sought to protect his loved ones? By any account, we know few details of his personal life, in fact, we’re not exactly sure how many children Charles had. The one child we do know of, though, is Charles Waugh Tanqueray, who took over his father’s distillery after his father died at 58. Tanqueray’s historians call Charles Waugh “an upright Christian gentleman of forceful character yet with social conscience,” and just like his father, Charles Waugh was a very young man when he began distilling. More of a businessman than an inventor, Charles’ son placed his attention on gin exclusively, resulting in Charles Waugh growing the Tanqueray brand much larger than his father, including his facilitating a merger with Gordon’s Gin—one of his father’s inspirations and competitors—in the late 1800’s. Charles Tanqueray really seems to have been a proud genius who both flaunted his talent and shrouded his family in mystery. Today, Tanqueray stands as one of the oldest and most successful gins in the history of the world. This entry was posted in education, gin, interview and tagged charles tanqueray, charles waugh tanqueray, gin, tanqueray, tanqueray gin, tanqueray history on March 27, 2017 by Greg. anCnoc is not a scotch I’ve had before, and I recently had an opportunity to pair their Blas bottling with a Hiram and Solomon Traveling Man cigar. Blas is a collaboration between anCnoc (pronounced uh-knock) and Scottish fashion designer Patrick Grant, which is why the label is so stunningly designed, plus you may get a bonus pocket-hankie as I did, too (pictured above). Make no mistake, this is a sweet and balanced scotch. A straw-colored highland whisky, Blas is caramely with a potent ABV of 54%. It has notes of vanilla bean and custard a slight rear palate barley-beer tang. It’s an excellent after-dinner drink and it’s a surprisingly sipper even at 54%. I’ve been taking mine with a single small ice cube to add just the right about of cool water. As expected, its a great couple for a cigar, too. anCnoc Blas retails for $80. This entry was posted in reviews, whiskey and tagged anCnoc, anCnoc Blas, anCnoc scotch, patrick grant, scotch, sweet scotch on March 24, 2017 by Greg.